English teacher, mum, blogger, interested in Web 2.0 and its impact on learning, education & literature. Hi! After having learnt in class the new vocabulary about the environment and seen the video on Global Warming I would like to share with you a video that reminds us of how we are destroying our planet because of our consumerism. It’s THE STORY OF STUFF. The next is a very interesting video from Ted, a nonprofit you’re already familiar with devoted to Ideas Worth Spreading that started out in 1984 as a conference bringing together people from three worlds: Technology, Entertainment, Design. The video by Mike Biddle is about recycling plastic. It’s pretty interesting and it well introduces the idea and goal of our module. Take down some notes: Have you learnt anything new or anything you hadn’t thought about before? I took the next photos while I lived in Ireland but I’m sure you can find similar depressing sights also here in Italy or in Pordenone. I really hope they will make you think over the importance of cooperating to preserve our environment, to reduce pollution & make our planet a better place. It’s not that difficult if you spread the word as regards the utmost significance of recycling not only paper, glass & plastic but also all electrical appliances. It’your right to have a better future and to say NO to this shame. 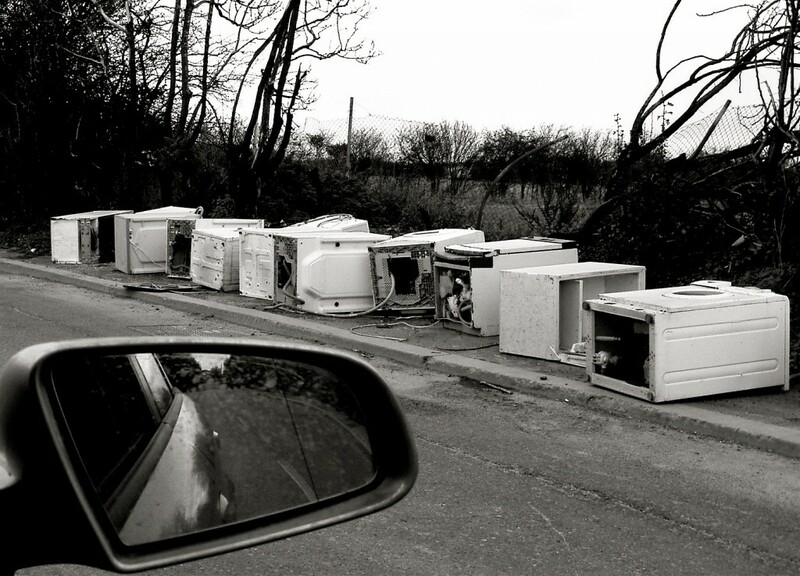 HOUSEHOLD APPLIANCES DUMPED at the side of the road. 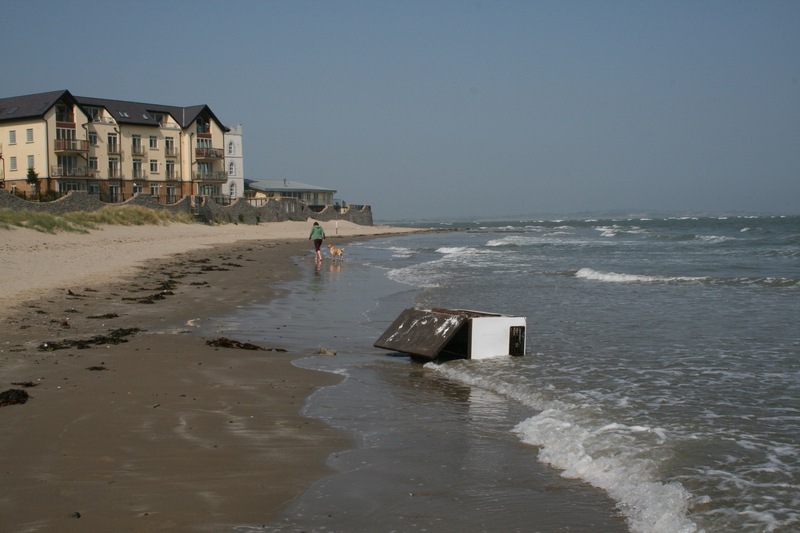 A fridge stranded on Howth beach. What a shameful sight! Now have a look at two stunning photography websites by Chris Jordan. The first is called Intolerable Beauty: Portraits of American Mass Consumption & left me speechless. Each image portrays a specific quantity of some kind of waste such as e-waste, mobile phones, cigarette butts, cell phone chargers, circuit boards, bullet casings, diodes, glass you name it! : VISUALIZING MERE NUMBERS MAKE THOSE REALITIES SOOOOO DAMN REAL! It thus makes us realize how important it is to preserve our environment! The second website depicts images of MASS CONSUMPTION like the one million plastic cups, the number used on airline flights in the US every six hours or the 106,000 aluminum cans, the number used in the US every thirty seconds or 400,000 plastic bottle caps, equal to the average number of plastic bottles consumed in the United States every minute. Choose the photo on the right, click and then ZOOM in the image. It’s just amazing!! Here’s a British GUIDE TO RECYCLING. Have a look! You can find a lot of new words you may need. I’m also adding some videos on HOW Electronic waste WEEE ( Waste from Electric and Electronic Equipment) can be recycled. I want to end this post by publishing 2 videos that I hope will make you think twice before dumping in the bid an old electric appliance. Please keep in mind that all this only happens when electrical waste is handled illegally. And that is exactly what the European Commission wanted to stop by implementing the WEEE European directive. E-waste in Ghana. Every year, tons of used electronics from North America, Europe and other industrialized parts of the world end up in countries like Ghana. This is where televisions, computer monitors and VCRs smuggled illegally come to die. Largely the business of boys and young men, electronics are torn apart, their plastic shells discarded or used as stools or buckets. The guts of computers hold copper, aluminum and other metals that can be sold for money. A kilogram of copper sells for about $4 – over half of Ghanaians live on less than $2 a day. Electrical wires and cables are some the main components holding the precious copper. To separate the metal from its plastic or rubber enclosure, fire is the fastest solution. Boys set ablaze the plastic casings of computers, sometimes throw in Styrofoam from old refrigerators to increase the intensity of the flames. They then throw in the wires or other components to burn off the plastic. The fire spews a thick, black smoke, releasing not only toxic fumes but chemicals that seep into the ground, meters away from the basic homes of Agbogboloshie, one of Accras poorest neighbour-hoods. According to a Greenpeace study, some of the chemicals released during the burning process can affect childrens developing reproductive systems, brain development and the nervous system. Ground samples collected from the area were found to contain toxic metals, such as lead, in quantities exceeding one hundred times background levels. Other chemicals such as phthalates – some of which are known to interfere with sexual reproduction – and chlorinated dioxins – known to promote cancer were also found in some of the samples. Hoping you have found this post of some help and interest I hope YOU WILL TAKE ACTION as the future of our planet depends on you. YOU CAN STOP ALL THIS! Thanks for your attention & remember that with a small action you can contribute to a sustainable future, guaranteeing good quality of life and a more efficient use of our planet’s resources 🙂 Leave a comment if you feel like.